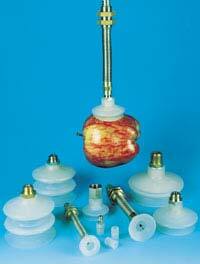 Selecting a style of vacuum suction cup is determined primarily by the product to be lifted. Flat Vacuum Suction Cups (listed below) are typically designed to handle flat or slightly curved surfaces. They offer fast attach/release times due to their small internal volume and are good for handling heavy, horizontal loads. 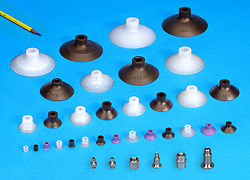 Flat vacuum suction cups with cleated bottoms to prevent puckering are useful for handling flat, flexible loads such as cardboard and sheet metal. Single (1.5) Bellows Vacuum Suction Cups are ideal for handling loads with uneven surfaces and irregular shapes. The bellows design compensates for product irregularities and varied heights. They have longer attach/release times than flat cups and are less suitable for lifting vertical loads. Double (2.5) Bellows Vacuum Suction Cups can be used in the same applications as single bellows cups, but can accommodate greater product irregularities and height variations. Double bellows cups are recommended only for horizontal lifting of loads. 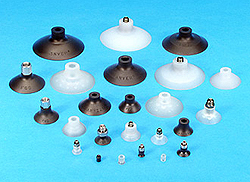 Flat vacuum suction cups attach quickly due to the small volume of air to be evacuated. They feature patterned knobs on the bottom to maximize capacity and are excellent for holding flat, flexible materials without deformation. Relatively stiff, the cup bodies retain their shape well in production applications. They are excellent for use on fast cycle transfer systems. Use on flat or slightly curved surfaces, and for horizontal or vertical lifting. The standard materials are Nitrile (NBR) and Translucent Silicone (SIT). For more information about materials, click here. The cup capacities shown above ( * ) are theoretical capacities based on 24″Hg at sea level with a safety factor of two (2) and a ± 5% margin of error. This is the US ANSI ASME Standard B30.20 for vacuum lifter specifications and is commonly used in North America as a design capacity for vacuum components. When used in vertical applications, take these values and divide again by 2 to obtain a 4 to 1 safety factor per the ANSI specifications. These are realistic working capacities when designing equipment. For example: ANVER vacuum cup number F52 has a rated capacity of 15.10 lb at 24″Hg. The pull-off capacity at 27″Hg for this cup would be 15.10 x 2 x 1.125 = 33.98 lbs. From this point, it is necessary to calculate the safety factor based on the vacuum level being used, and the altitude. To ensure safety, 80% of actual overall diameter is used when determining Load Capacity.